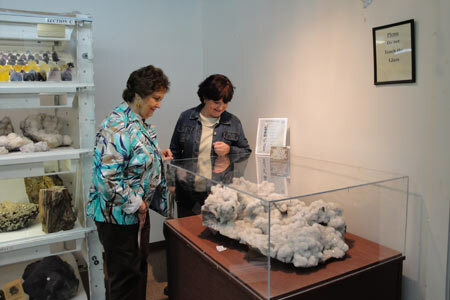 The Ben E. Clement Mineral Museum offers a variety of tours. We have hosted church groups, college students, Red Hatters, bus tour groups, and many others. For groups of 10 or more please contact the museum to make a reservation for your group. The cost of a tour is $5.00-$8.00 per person, with a group reservation. 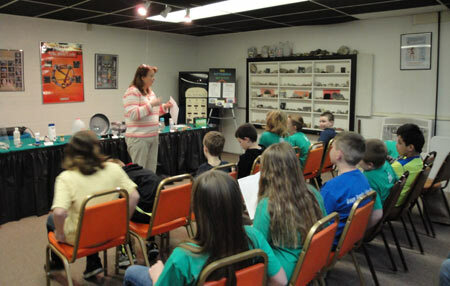 To schedule a tour for your group please call the museum at (270)965-4263 or e-mail us at beclement@att.net. What’s Under Your Feet? (Grades K-2) Students will discover what is under their feet with a hands-on study of rocks and minerals. They will work together to determine how to group and classify objects based on simple characteristics and basic properties. They will also discover many uses of rocks and minerals in their everyday lives. Basic Rocks and Minerals (Grades 3-6) Students will conduct a hands-on discovery activity to determine the difference between a rock and a mineral. They will then learn about the 3 different types of rocks; sedimentary, igneous, and metamorphic. Finally, they will explore the many uses of rocks and minerals in their everyday lives. A Paste with A Taste (Grades 4 and up) Students will use minerals to produce a “marketable” product to be used every day, by most people. They will compare commercial brands of similar products to determine how the components contained in the product add to the price. They will then develop a 15 second advertisement for the product which they have developed. Finally, they will be introduced to other minerals and will learn how minerals are used in everyday life. Messy Mining (Grades 6 and up) This activity gives students an introduction to the economics of mining, the process of ore extraction, and the concept of reclamation. In a simulation, students gain profits by successfully extracting minerals from their ore, using mining equipment they have chosen to purchase. However, they must pay expenditures for the mining process, for disposing of waste, and to reclaiming their land wisely. After conducting this simulation, the students will use their math skills to determine if they made a profit. They will then be introduced to other minerals and will learn how many minerals are used in everyday life. Basic Tour with Classroom Discussion – all levels – The students will visit the classroom to learn about how minerals affect their lives everyday and they will have an informative tour the museum. The cost of this program is $5.00/student. The museum offers tours for boy scouts. On these tours the Tiger Cubs, Cub Scouts, and Webelo Scouts can earn their geology belt loop and/or their geology academic pin or badge. The cost for this program is $8.00 per scout. If you are interested in scheduling a scout tour to earn these items, please call the museum at (270)965-4263. There are picnic tables on the grounds for group use. Plus, a wonderful gift shop for the scouts to purchase geology related items.